CleanTechnica was just wondering about the potential for equipping San Francisco’s new hydrogen fuel cell ferry boat with a gizmo for producing hydrogen on-the-go, when along comes Sandia National Laboratories with a new report that suggest another scenario: research vessels! Why is this so exciting? Last year, the British Natural Environment Council touched off an international firestorm of fun when it enlisted the public to name its new Antarctic research vessel. Boaty McBoatface was the overwhelming favorite. 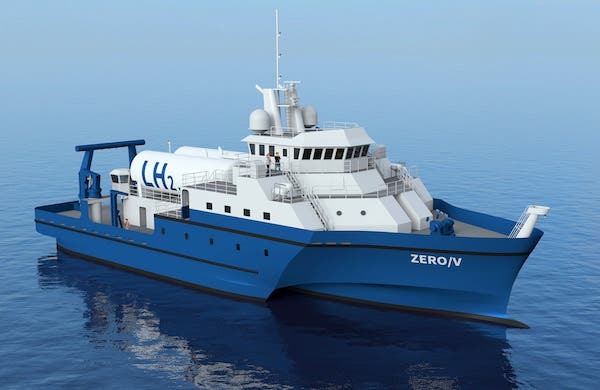 Come on CleanTechnica readers, let’s see if we can match that — check out what Sandia says about its idea for a hydrogen-powered research vessel, and drop us a name in the comment thread. Before we get to the latest news from Sandia, let’s catch our breaths and begin at the beginning. The main source for hydrogen today is fossil natural gas, but there are also a number of renewable pathways, such as engineering a photochemical reaction or “splitting” water with an electrical current. The US Navy is already experimenting with an onboard system that can produce H2 from seawater, so just imagine the logistical advantages for seagoing operations — especially if combined with solar or wind power to generate the electricity (check out this “Robojelly” fuel cell device for more underwater fun with scavenged hydrogen). Those logistical advantages are not particularly in play when it comes to ferry boats, which is part of the reason why San Francisco’s new fuel cell ferry — the first of its kind in the US, btw — is being designed to store a two-day supply of hydrogen. That brings us around to the latest news from Sandia. The lab is taking a close look at the feasibility of using hydrogen fuel cells to power research vessels. To be clear, the proposed to vessel is already named Zero-V, and the lab is looking at storing liquid hydrogen on board, not developing a whole new contraption to produce hydrogen on board. Still, the storage angle is a mighty hill to climb when it comes to planning for voyages longer than a short ferry hop. Mapping or installing equipment on the ocean floor requires a vessel to be stable over a single point for long periods, even if there is wind or waves. Aside from technological issues, complying with marine and port safety regulations is a major challenge. One of the biggest additional benefits of using hydrogen to power a boat is the absence of ecologically damaging fuel spills…it is impossible to have a polluting hydrogen spill on the water. More buoyant than helium, hydrogen rises on its own and eventually escapes into outer space. The only emission from fuel cells is water, which as Sandia points out is practically drinkable. The emitted water could be recycled for use on board, by the crew and/or for lab work, saving the expense and energy involved in desalinating seawater for general use. So far, the lab is looking at the application for coastal research, where regular refueling is available, and it has just released the results of its new feasibility study. …Feasibility was found for a 10-knot vessel with 2400 nautical mile range, able to perform 14 Scripps science missions, and could be refueled with liquid hydrogen at 4 different ports of call along the U.S. west coast. …finding a way to store the heavy hydrogen tanks while accommodating at least 18 scientists, 11 crew members and three laboratories was a challenge… Part of the solution was selecting a trimaran boat design…The design offers a great deal of space above deck for the tanks, and adequate below-deck space for other science instrumentation and machinery. As far as feasibility goes, Sandia also checked with the US Coast Guard to confirm there are no “show-stopping” issues. So, wanna get the jump on Scripps and name (ok, so re-name) its new research vessel before it even gets off the drawing board? Go for it! Meanwhile, Sandia is already thinking that the technological underpinnings of its Zero-V vessel could be transferred to even larger boats, including cargo ships and cruise ships. The new study was funded by the US Department of Transportation’s Maritime Administration, so it’s a reasonable bet they’re taking a good look at broader applications. In the category of “this is why we can’t have nice things,” though, the risk is that DOT could be eyeballing liquid hydrogen in the bigger context of US energy development, meaning that fuel cell vessels could be yet another growing market for hydrogen sourced from natural gas. Or, maybe not. Maybe renewable hydrogen technology will go mainstream in tandem with the development of fuel cell ships. Before we take leave, let’s note for the record that Sandia’s expertise in seagoing fuel cells is also the foundation for the company Golden Gate Zero Emission Marine, which is organizing that new ferry boat for San Francisco. The new ferry uses renewable hydrogen sourced from water-splitting and we’re reaching out to GGZEM for an update, so stay tuned for more on that. If you’re thinking we could do a naming contest for the ferry, too late! The catamaran (that’s two hulls, btw) will sail under the name “Water-go-Round” when it launches in 2019. Image: courtesy of Glosten via Sandia National Laboratories.